President Trump this week proclaimed “the Republican party will soon be known as the party of health care.” Apparently he was referring to his and his party’s efforts to kill healthcare dead: Trump’s proposed budget, along with his administration’s surprise decision to back a full repeal of the Affordable Care Act (ACA) in the courts, would deprive millions of Americans of healthcare coverage while rewarding wealthy Americans and prescription drug and health insurance companies. We calculate that by overturning the ACA Trump would make a stealth gift to his cronies among the rich and healthcare corporations worth $606 billion over 10 years. How could this be so? As part of the ACA, Congress passed a set of taxes on the wealthy and a handful of health care industries in order to finance expanded healthcare coverage for the newly insured Americans. Using data from the nonpartisan Joint Committee on Taxation (JCT) we broke down how an ACA repeal would eliminate those taxes in the chart below. 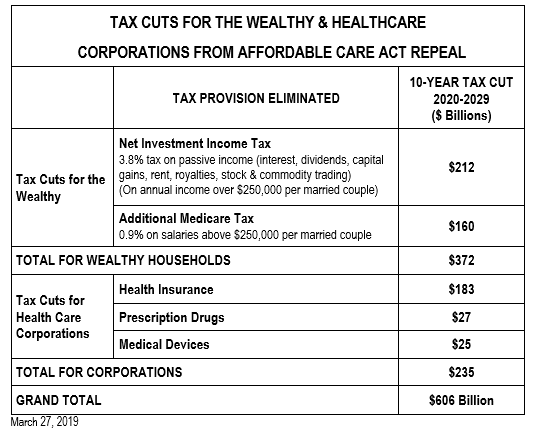 Under the ACA, wealthy married couples with income above $250,000 have to pay a 3.8% tax on investment income and an extra 0.9% Medicare tax on wages (in addition to the 2.9% Medicare tax everyone already pays). Eliminating the ACA would get rid of both of these taxes and give wealthy households a heaping $372 billion tax cut over the next 10 years. Similarly, repealing the ACA would save health insurance, prescription drugs and medical devices corporations $235 billion over the next 10 years. It goes without saying that many of these corporations were among the leading beneficiaries of the 2017 Trump-GOP tax cuts. While corporations and the rich enjoy yet another new tax cut, who is going to pay the price of the ACA repeal? Short answer: the 20 million people who would lose their health insurance. Moreover protections for up to 130 million people with pre-existing conditions would also be eliminated. After a midterm election in which many voters clearly repudiated Trump’s healthcare agenda, it’s ironic to see Trump pick yet another fight with a program considerably more popular than his presidency. Trump giving one more round of tax breaks to the wealthy and big corporations while taking away working families’ healthcare sure isn’t going to help his standing with the public. Joint Committee on Taxation (JCT) figures projected forward for 2027-2029 using an observed linear annual growth rate.